Any tasty edible mushroom that extends our season by appearing either earlier or later than other mushrooms would be an automatic favorite of ours. Such is the case with Hydnum, fondly referred to in this post using the Curry County name of choice: Hedgehog, or (less often) Sweet Tooth. Hedgehogs have a lot of other fine qualities going for them besides their fruiting season. For one thing, they’re very common, relatively easy to find and predictable in their chosen habitats. Moreover, they usually come back to the same spots, year after year. They’re hardy, even withstanding light freezes which can signal the end of the season for many other mushrooms. They’re almost goof-proof, i.e. almost unmistakable for anything else - another plus that makes them ideal for novice mushroomers. They’re tasty, with a flavor and aroma much like Golden Chanterelles (which is a good thing to be “like!”) and are well suited for sautéing as an accompaniment to an entrée such as steak and for enhancing sauces. They preserve well, either by dehydrating or sautéing and then freezing in portion sized quantities. And they are beautiful, with colors ranging from tan to apricot to deep orange. Here in the refuge, there are times when they appear to almost glow from within the duff on the forest floor, particularly so when a light fog hangs in the air. So, what’s not to like about Hedgehogs? Hedgehogs can vary greatly in size. Well, there are a couple of small niggles when it comes to Hydnum. Most of the Hedgehogs that we find in the refuge are H. umbiculatum which generally offer a pretty small cap – 1 to 2-1/2” diameter caps are the norm, although we've found individuals up to nearly 5”. Therefore, it takes a little longer than, say, Golden Chanterelles, to gather a significant quantity. Our Hedgehogs also seem to have an affinity for Rhododendrons, and that can mean crawling on hands and knees through a woody thicket to gather them – not my favorite way to harvest mushrooms, but sometimes a necessary evil. Lastly, they can be more challenging to clean than a lot of mushrooms. Removing the debris from among the tiny teeth that cover the underside of the cap where gills would normally be found can be frustrating, but this almost always happens as they join other mushrooms in your basket, not naturally. The stems, however, are another matter; any part of the base of the stem that comes in contact with the soil almost invariably absorbs some of it in the outer layer, and it clings tenaciously; forget washing or brushing it off. Yet, there is a fair amount of meat in the base, and if you are as averse to unnecessary waste in mushrooming as we are, simply cutting off the base isn’t always acceptable, either; our solution – time-consuming, but it works – is to trim this dirty area off the larger mushrooms with a knife, something like sharpening a pencil. Normally we do this in the field, and (although we're not sure this helps future fruitings) stuff the trimmings back into the hole from which they came. Call us crazy, but it seems unwise to anger the mushroom gods by being wasteful. There are times, I have to confess, when we’re not so fussy about the stem. Thankfully, the stem easily snaps between one’s fingers, leaving the base of the Hedgehog in the ground while the upper part of the stem and cap are resting in one’s thankful hand! of the cap rather than gills. In Northwest Oregon and Southwest Washington, we normally expect to start finding Hedgehogs in mid to late October, and continue to find them for at least a month, often well into December if it doesn’t remain too cold for too long. In Port Orford, on the Southern Oregon coast, Hedgehogs are typically later, like everything else. We customarily start seeing them in early November, or after the first frost. Frequently we can gather them into February - a Super Bowl Sunday Hedgehog Foray is a time-honored tradition for us! There is always some overlap between the end of Golden Chanterelle season and the start of Hedgehogs, and indeed at first glance, the novice picker might mistake Hedgehogs for Chanterelles. On closer observation, though, you’ll see a subtle difference, as the Hedgehogs possess a somewhat paler cap. Turn the cap over and there can be no doubt: the teeth are a dead give-away. 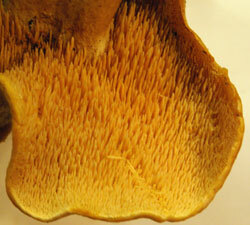 The Hydnum's teeth (spines) on the underside of the cap are about 1/8 to 1/4 inch in depth and break fairly easily. They range in color from whitish to light brown and seem to darken with age. Be aware that there are actually a number of toothed fungi that exhibit these icicle-like protrusions under the cap besides the Hydrum. These include the large capped Sarcodon, the tough and leathery Phellodon, the Bankera with a large fruit body and brittle flesh, and Hydnellum with a tough and fibrous cap. Some members of the toothed fungi family are valued for dyeing wool rather than for their edibility. Some grow on wood; most are found on the forest floor. Some are fragrant and offer a pleasant aroma; others have no detectable smell. Caps range from deeply pitted to scaled and/or smooth with a color assortment that moves from gray to buff to dark reddish brown along with shades of yellow. Spores fluctuate from white to brown. One toothed fungi even exudes red droplets in wet weather! Toothed fungi certainly reveal an amazing variety of characteristics! While there are a number of toothed fungi, it is the 2 species of white spore Hydnum (umbiculatum and repandum) that we encounter with great frequency and enthusiasm in the refuge and that are most commonly considered a choice edible. and shapes that hedgehogs display. Now, how can you easily tell if you’ve collected H. umbiculatum or H. repandum? The H. repandum often has a cap that measures 2-6 inches and is irregularly shaped, a stem that is usually off center, habitually fruits in groups under hardwoods (although it sometimes can be spied resting under conifers), and presents a stem that is shorter and thicker than H. umbiculatum. 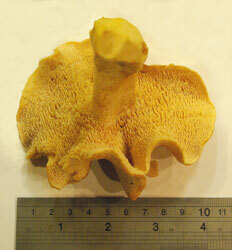 The flesh in the convex cap is thick and substantial for the size of the mushroom. Does it really matter if the Hydnum is H. umbiculatum or H. repandum? Not to us. 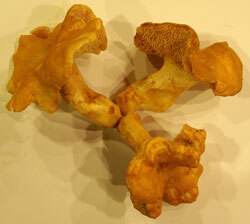 We don’t personally differentiate between the two Hydnum. The bottom line is that they are both lovely, tasty mushrooms, always welcome on our table, and they help us to extend our mushrooming season long after most other good edibles are all done for the year. So, like we said earlier in this post: what’s not to like about Hedgehogs?